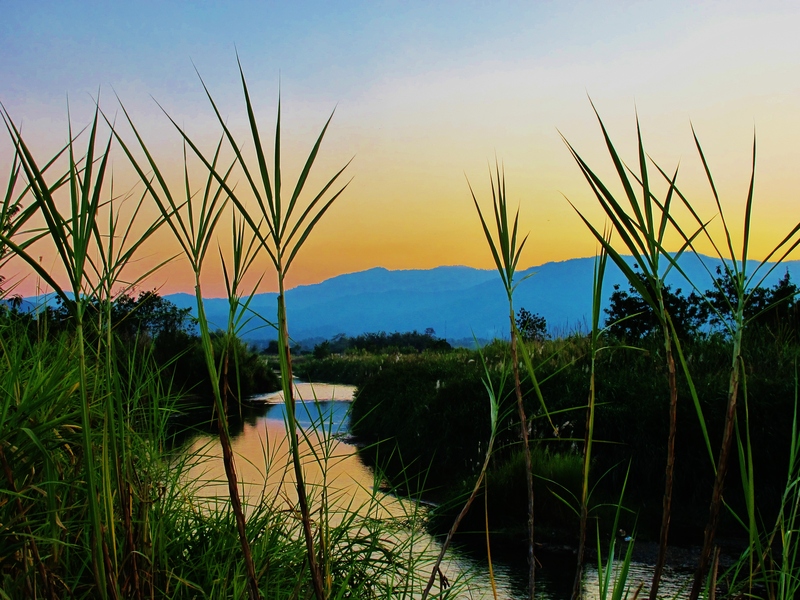 Sunset at the Ping River, south of Chiang Dao (photo taken in February 2015). I spent 8 days in the area on various dates between August 10th and 22nd, 2015. The weather was quite good, with only one day of constant rain – in fact many of the days were predominantly hot and fairly sunny with an occasional heavy afternoon shower or overnight rain. The trails are muddy and slippery. The Nature Trail and Fence Trail are very steep on places and in my view basically impassable, even dangerous. The Summit Trail is not maintained at this time of year, and is officially closed – again it would probably be impassable even for the truly determined. The Gully Trail near the temple contains water during this season. Rain boots are necessary, and overhanging vegetation is only periodically cleared by the monks. In other words, not ideal birding conditions. Although I didn’t try going there, I expect the DYK substation area would be impossible to reach unless you have a good 4×4 vehicle and plenty of skill. The approach track is extremely steep in places and would be very slippery and muddy after rain. Mosquitoes are abundant especially early and late. Owls and other night birds are not vocal at this time. Bird activity is high, and continuous throughout the day. Very few other people are around, making for relaxing birding. It doesn’t rain as much as you might expect from the “rainy season” and my birding activities were rarely curtailed by the weather. I birded for just a few hours each day in the early morning and usually for an hour or two in the late afternoon. I spent almost all of my birding time around the Wat Tham Pha Plong, along the road between there and Chiang Dao Nest 1, and on the Muang Khong road as far as the checkpoint. I tried and failed to get far along the Gully, Fence and Nature trails. On one occasion, I drove beyond the checkpoint as far as the high point of the Muang Khong road (at about Km 16), and I made one afternoon visit to the Chiang Dao rice paddies. Scaly-breasted Partridge: two at the beginning of the Gully Trail. Rufous-winged Buzzard: one from Chiang Dao Nest 1. Besra: one along path to monk’s residences above gully. Banded Bay Cuckoo: heard only, near start of Summit Trail. Collared Owlet: heard calling several times near the temple, the only owl species heard. Crested Treeswift: easy to see at this time of year, viewable daily from Chiang Dao Nest 1. Orange-breasted Trogon: one in forest along the jeep track on the right, just before the high point of the Muang Khong road. Oriental Pied Hornbill: up to 4 birds together, seen regularly late afternoon from the temple or checkpoint road. Blue-bearded Bee-eater: seen opposite Chiang Dao Nest 2 and along checkpoint road. Grey-headed Woodpecker: a pair about 50 meters before the checkpoint, my personal first record of this species in the area. Long-tailed Shrike: one near the river south of the rice paddies, a nationally declining species. Large Cuckooshrike: one near highest point of Muang Khong road. Streaked Wren-Babbler: one at the temple steps but much less conspicuous here than in the dry season. Black-throated Laughingthrush: a pair in thick scrub behind Chiang Dao Nest 1 seen twice from my bungalow balcony, and another opposite Chiang Dao Nest 2, not a bird I have seen here in the dry season. Dark-sided Flycatcher: one near the spirit houses at about Km 13 of the Muang Khong road, presumably an early passage migrant. White-crowned Forktail: one on the stream 100 meters before the checkpoint. Thick-billed Flowerpecker: in trees next to the high point of the temple. Purple-naped Spiderhunter: one next to the temple steps. Baya Weaver: several breeding colonies beside the river south of the Chiang Dao rice paddies. 2015 Year Ticks: Blue-bearded Bee-eater, Besra, Chestnut-capped Babbler, Scaly-breasted Partridge, Orange-breasted Trogon, Purple-naped Spiderhunter, Thick-billed Flowerpecker (total 834).